A boat trailer is something you really can't go wrong with, as it is a dual purpose device. It provides a convenient way to store the boat, and also allows you to explore new areas by taking your boat down the road. Good trailers must perform both duties equally as good. Most people buying boats are into getting the boat, and not the trailer. They are more than willing to spend money on a boat, then end up getting a cheap trailer. If you want the most from boating, these tips will help you with buying a trailer. 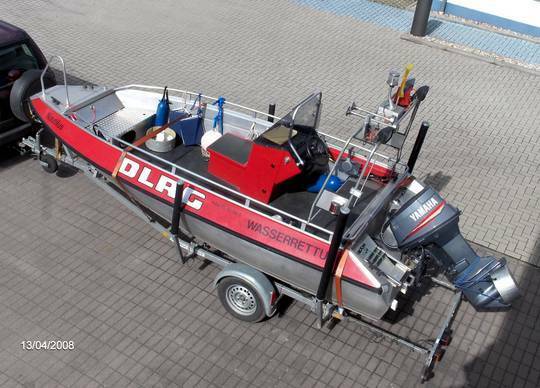 - The total weight of the boat, gear, and motor should be in the mid range of trailer's carrying capacity. You shouldn't pick a 2,500 capacity trailer if you have a boat with the same weight. - Go for larger diameter tires and wheels. The larger tires will rotate less times per mile, producing less heat and wear on the tread. The wheel bearings will last much longer as well, as they rotate less times per mile. - You should look for trailers with "drive on" capabilities. These drive on trailers will allow you to drive the boat onto the trailer, close enough to the winch so that you only need to winch the boat up a few inches. - Select trailer lights (for the highway) that are protected and sealed against water. - Pick your trailer based on the environment it will be operating in. If you plan to launch in salt water, you'll need a trailer for that purpose.There are many types of trailers available, each one designed for a specific type of boating. Although most are protected against weather and rust, you should always pick the one designed for the type of terrain you will be using your boat with. This way, you have no worries about your trailer not doing the job it should be. There are some trailers that include a spare tire, which is an excellent investment for those who plan to travel long distances. Even though it can be hard to find trailer tires in the dark, it's still great to have a spare if you get a flat while you travel. All in all, a boat trailer can save you a lot of time and money. You can store your boat on your trailer when it isn't be used, even take it to other lakes or oceans. A trailer will open up new roads for you and your boat - all you have to do is find one that you need.